To assess children’s individual stages of mathematical development, as well as their developmental trajectories, different diagnostic approaches have been developed. 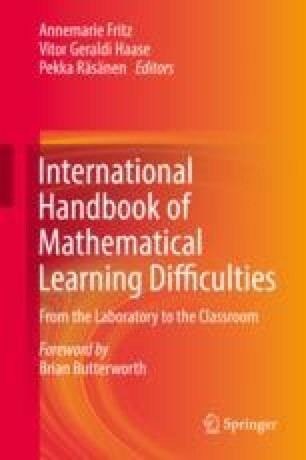 Based on the test results of such approaches, children with mathematics learning difficulties are identified and programs to enhance mathematical learning can be developed and evaluated. In this chapter, quality characteristics of assessment are described (reliability, objectivity, validity, and provision of norms). Different categories are presented to classify approaches to assessing mathematical competence and performance (norm-referenced versus not-norm-referenced tests, individual versus group testing, paper-and-pencil tests versus interviews versus computer-based tests, chronological versus educational age–oriented tests, speed versus power tests, and principles of task selection). Drawing on selected approaches, different principles of task selection are discussed (curriculum-based, based on neuropsychology theories, or based on developmental psychology theories) together with their consequences for the interpretation of respective test results. Finally, some promising research trends are outlined.